Click the map to open a larger, printable PDF version. To view & print the map, you will need Adobe Acrobat Reader. 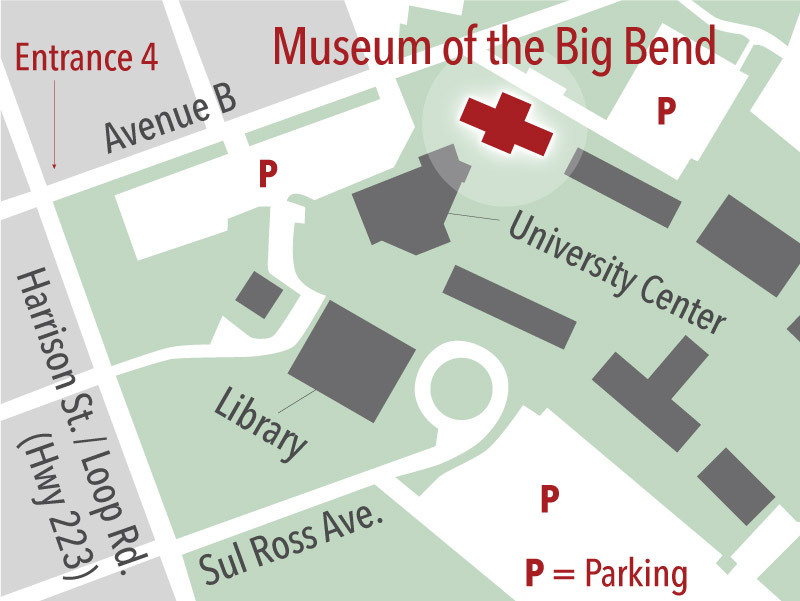 The Museum is located at the northeast corner of the Sul Ross State University campus and can be reached only via Entrance Four from Harrison Street. Once on campus, follow the small, brown signs. See map at left for more details. Sul Ross State University is a tobacco-free campus. Private tours guided by museum staff are available to groups of 8 or more. Tour covers the permanent exhibits, Big Bend Legacy as well as temporary exhibits. Cost is $5 per person and 7 day advance reservations are required. For more information and to schedule your visit, contact Maggie Rumbelow at ude.s1555773164sorlu1555773164s@wol1555773164ebmur1555773164.eigg1555773164am1555773164. 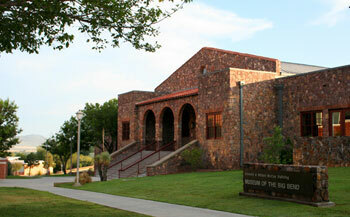 The education program at the Museum of the Big Bend welcomes all school groups. We offer a variety of activities and interactive tours customized for your students. For more information and to schedule your visit, contact Maggie Rumbelow at ude.s1555773164sorlu1555773164s@wol1555773164ebmur1555773164.eigg1555773164am1555773164.